Violet died on 15 August 1994 at age 88. [S929] BDM QLD Registry, birth record, Reg. No. 1906/C9507 (mis-indexed as Voilet). [S488] Index - Queensland BDMs (online and fiche), at https://www.qld.gov.au/law/…, Marriage Reg. No. 1928/B2850, p3434. [S117] Census - 6 Jun 1841, UK census, ED 3 HO107-459-19 Folio 39 p3 GSU roll 306853. [S237] Family Tree - A Agnew, "James Robinson descendants" , incorrect date and place in this source. [S118] Census - 30 Mar 1851, UK census, ED 5e HO107-1618 Folio 290 p17-18 GSU roll 193519. [S190] Index - GRO and Office of National Statistics, England & Wales Civil Registration Qtrly Indexes, Marriage: District of Maidstone, Vol 2a, p593. [S871] FamilySearch, at https://familysearch.org/, FHL 1866562, item 1 p17, Batch No. I01114-2, Marriage Banns 1833 - 1901. [S183] National Archives Film - Queensland BDM Indexes, Microfilm, Reg. No. 1917/025136. [S753] Australian BDM Indexes 1788-1950, at http://www.ancestry.com/, Queensland, Reg. No. 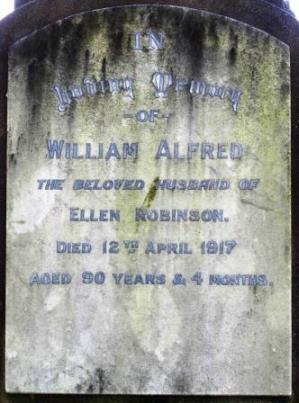 1917/B25136, p1721, son of James Robinson and Mary. [S930] BDM QLD Registry, death record, Reg. No. 1917/25136. [S489] Brisbane City Council Cemeteries database, at https://graves.brisbane.qld.gov.au/, Grave 77, Portion 12. [S537] Newspaper - Brisbane Courier / Courier Mail, issue of 13 Apr 1917, Funeral notices, p6, col1. [S190] Index - GRO and Office of National Statistics, England & Wales Civil Registration Qtrly Indexes, Birth: District of Hollingbourne, Vol 2a, p461, 4Q1857, mother's maiden name BAKER. [S753] Australian BDM Indexes 1788-1950, at http://www.ancestry.com/, Queensland births, Reg. No. 5221, p22357. [S488] Index - Queensland BDMs (online and fiche), at https://www.qld.gov.au/law/…, Birth Reg. No. 1865/B3744. [S183] National Archives Film - Queensland BDM Indexes, Microfilm, Reg. No. 1865/B003744. [S488] Index - Queensland BDMs (online and fiche), at https://www.qld.gov.au/law/…, Marriage Reg. No. 1885/B009609. [S183] National Archives Film - Queensland BDM Indexes, Microfilm, Reg. No. 1885/B009609. [S183] National Archives Film - Queensland BDM Indexes, Microfilm, Reg. No. 1934/B023904. [S120] Family Group Sheet - I Kemp, "Family group: Robinson-Collins", details in these records appear erroneous. [S488] Index - Queensland BDMs (online and fiche), at https://www.qld.gov.au/law/…, Death Reg. No. 1956/B12253. [S753] Australian BDM Indexes 1788-1950, at http://www.ancestry.com/, Queensland deaths, Reg. No. B12253, p2190. [S753] Australian BDM Indexes 1788-1950, at http://www.ancestry.com/, Queensland births, Reg. No. B53281, p22359. [S396] Ryerson Index to Australian Newspaper Death and Obituary Notices, at http://www.rootsweb.com/~nswsdps/dpsindex.htm, Sydney Morning Herald of 16 Sep 1974. [S284] Index - New South Wales BDMs online, at http://www.bdm.nsw.gov.au, Death Reg. No. 15454/1974. [S612] GRO Scotland, birth/bapt record, District of Hutchesontown, Statutory Births, GRO 644/10 0790. [S1044] Census - 29 Sep 1939, UK Register, RG101/3967B/017/41, Letter Code: LDCS, Schedule 219 (although her birthdate is 5 yrs younger than reality). [S917] GRO Scotland, marriage record, District of Dennistoun, Statutory Marriages, GRO 644/03 0513. [S916] GRO England & Wales, death record, District of Camberwell, Vol 1d, p522, entry 254, aged 2 mths. [S916] GRO England & Wales, death record, District of Liverpool, sub-district Edge Hill, Vol 8b, p246, 4Q1933, aged 65. [S916] GRO England & Wales, death record, District of Wallasey, Vol 10a, p1103, entry 5, aged 74. [S612] GRO Scotland, birth/bapt record, District of Dennistoun, Statutory Births, GRO 644/03 1748. [S612] GRO Scotland, birth/bapt record, District of Dennistoun, Statutory Births, GRO 644/03 2307. [S914] GRO England & Wales, birth record, District of Camberwell, Vol 1d, p822, 3Q1898. [S914] GRO England & Wales, birth record, District of West Derby, Vol 8b, p688. [S917] GRO Scotland, marriage record, District of Calton (glasgow), Statutory Marriages, GRO 644/04 0088. [S160] National Archives Film - NSW Pioneers Index; microfiche, Entry No. 15234. [S6] Newspaper - Times of London, Monday, Sep 02, 1929; pg. 15; Issue 45297; col C.
[S418] Ancestry.com - misc sources, at http://www.ancestry.com/, Quebec, Vital and Church Records (Drouin Collection), 1621-1967. [S801] Newspaper - Auckland Star, issue of 17 Oct 1912, issue 249, Vol XLIII, p12, col1, Marriages. [S542] Index - New Zealand BDMs online, at http://www.bdmhistoricalrecords.dia.govt.nz/, Birth Reg. No. 1889/7584. [S801] Newspaper - Auckland Star, issue of 31 Oct 1888, issue 257, Vol XIX, p8, col1, Births. [S542] Index - New Zealand BDMs online, at http://www.bdmhistoricalrecords.dia.govt.nz/, Death Reg. No. 1941/20460. [S863] Newspaper - New Zealand Herald, issue of 13 Jun 1941, issue 23990, Vol LXXVIII, p1, Deaths. [S866] Rotorua Lakes Council Cemetery database, at https://www.rotorualakescouncil.nz/our-services/…, Rotorua Cemetery, Block 2, Section 14, plot 3.